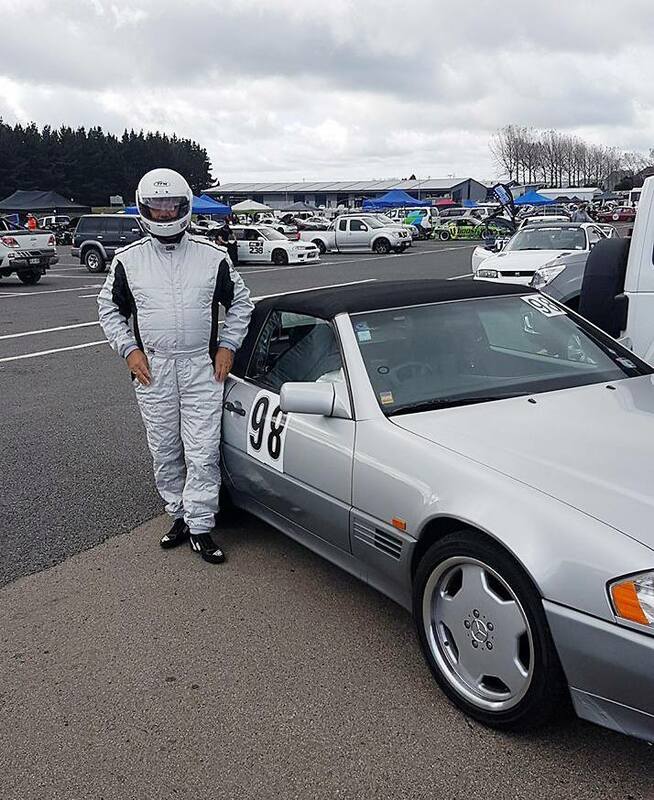 On the day the Auckland Mercedes Club were doing their Top Down run I couldn’t make it as I was commentating at the Historic Racing Clubs meeting at Bruce McLaren Motorsport Park in Taupo. This is a meeting for Formula Libre Racing cars, 2K Cup race cars, Historic Muscle & Saloon Cars, Trofeo Race series and Super Lap competitors. Super Lap is the new growing form of motorsport and is especially popular with younger drivers. Effectively it is all about achieving one fast lap and you get several runs over the weekend to practice, with all eyes on the final “One Lap” run. The series is broken up into three classes. Class One is called “Pro” and this is for all out Time Attack cars or full blown race cars. These are fully stripped out with massive aero, slick tyres, race suspension and hugely powerful motors, with the fastest cars achieving 1:29:00 sec laps at Taupo. Class Two is called “Pro Street” and this is for road registered race cars that typically are highly modified and run full roll cages and race suspension but are street legal, although with dot rated racing tyres. Class Three is called “Street” and this is split into two groups, being modified road cars in one group and near standard road cars in another. Needless to say this series is predominantly made up of young guys with Skylines, Mitsubishi Evos, Subaru Imprezzas and Hondas, with an occasional smattering of BMW E36s. The older generation are generally represented by some highly modified Holden Commodores and Ford Falcons. Although on this occasion there was one older bloke running a Porsche Carrera GT2 in Class Two. So in a bit of a PR stunt I decided I would run the SL500 in the street class and we rigged up a cell phone in my helmet connected to the PA system at the track so I could give commentary from the car. Unfortunately that didn’t work out too well as we kept getting massive back feed. So how did the R129 SL500 fair on its track debut? Well firstly, you have to realise that these things were built for high speed jaunts across Europe and are geared for Autobahns not overgrown Go Kart tracks like Taupo race circuit. Secondly, the driver (read bill payer) was not prepared to screw a brand new set of Bridgestone Potenzas or chew up a relatively new set of Ferrodo Pads. Consequently the gearing really kept me in second gear for a majority of the lap with the only exceptions being the front straight (3rd) and the main straight (4th just). Needless to say my desire to protect my brake pads had me braking for the switchback off the back straight at the 300 metre mark (in my race car it is 80 metres). End result was a best lap of 2:10:37. If I had a decent set of race pads installed and if I wasn’t being kind to the tyres, a low 1:59:00 would have been achievable. In summary it was a bit of fun and the crowd loved seeing the Merc (sans roof) blasting around with the gorgeous sound of the 5 litre V8 singing at 6000rpm. Whilst the youngsters thought it was pretty cool to monster me around the tight stuff in their Evos and Imprezzas, they did get a bit of a fright when we hit the main straight and Bremen’s finest stormed away from the Orientals. 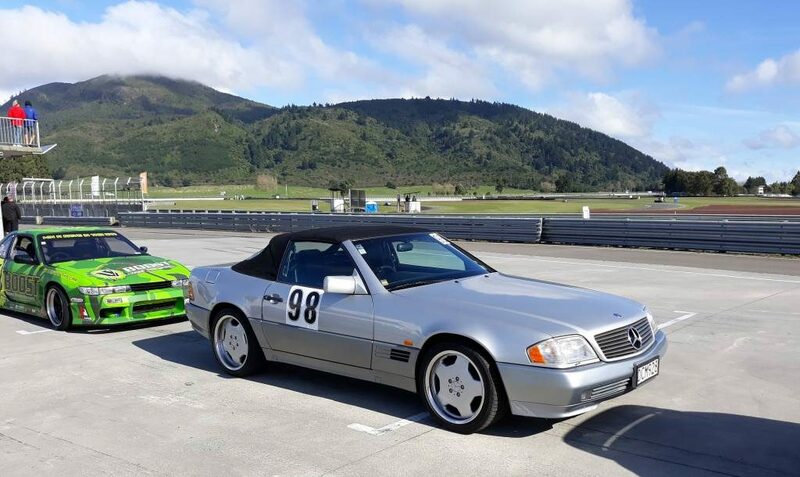 The verdict is that the SL500 is an awesome road car but probably not ideal for small tight circuits like Taupo. 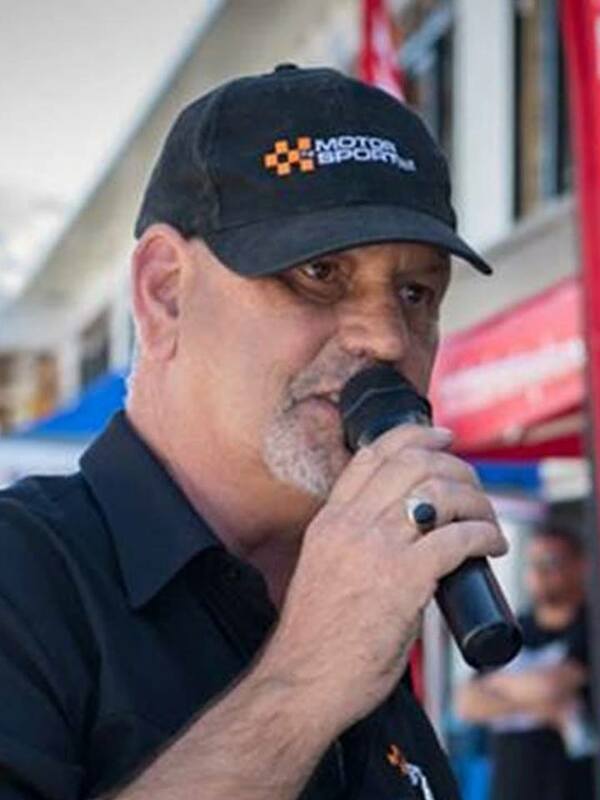 If it does see the track again then I will limit it to Pukekohe or Hampton Downs and it will be fitted with a set of Pagid race pads and the original 16 inch rims shod with a set of dot rated tyres to save my 18 inch Mono blocks and Bridgestones. But in all reality I think it is time to haul the race car out of hibernation and let that loose again.